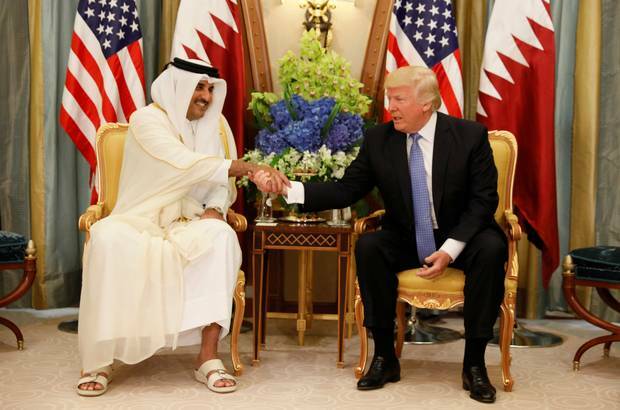 President Trump seemingly made a shift Monday over his stance on Qatar in the crisis opposing it to Saudi Arabia, United Arab Emirates, Bahrain and Egypt after the US leader congratulated the Qatari Emir over the fight against terrorism. The White House in a statement Monday announced that the occupant of the Oval House held a phone conversation with Sheikh Tamim bin Hamad Al Thani commending the Qatari leader for his country’s efforts to combat terrorism. “The president thanked the Emir for his action to counter terrorism and extremism in all forms,” the statement said. Saudi Arabia and its allies on June 5 severed ties with Qatar over allegations that the gas-rich Gulf country sponsors terrorism. The four also cut off trade as well sea, air and ground links with the Gulf Cooperation Council member. The crisis emerged following Trump’s visit to the region where he met with leaders of the Arab world. The US leader in a series of tweets took credit of Qatar’s isolation therefore backing the Saudi-led quartet. Trump then mobilized his top diplomat Rex Tillerson to help dissipate the crisis opposing the US allies in the region. Tillerson in September started mediating the feud, but late last year he said the crisis seemed unlikely to end soon, citing Saudi Arabia’s refusal to dialogue. Qatar has rejected the accusations and refused to abide by 13 conditions imposed by the Saudi-led quartet. These include shutdown of Doha-based al Jazeera network, reduction of ties with Iran and suspension of Turkish military buildup in Qatar. Trump in the phone conversation also proposed partnership with Qatar to counter Iran, become Qatar’s second major partner in the region behind Turkey. “The leaders discussed areas in which the United States and Qatar can partner to bring more stability to the region, counter malign Iranian influence…,” the White House added. Written by: KanelkaTagba on January 16, 2018. Posted by KanelkaTagba on Jan 16 2018. Filed under Gulf News, Headlines. You can follow any responses to this entry through the RSS 2.0. Both comments and pings are currently closed.